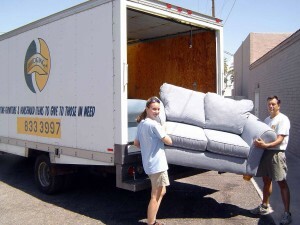 Bridging AZ is Arizona’s first and largest Furniture Bank. At Bridging we take pride in providing useful, quality furniture to clients of our participating agencies. There are over 70 Furniture banks across the country. To find one in your area, please visit the Furniture Bank Association website. Founders Jim & Donna unloading a couch. Bridging AZ serves as a clearinghouse for donated furniture and household goods to be distributed to qualified families and individuals in need. Recipients are identified and qualified by partnering social service agencies where the clients are enrolled in programs supporting their transition from temporary to permanent housing. These case-management programs support families and individuals moving into self-sufficiency. 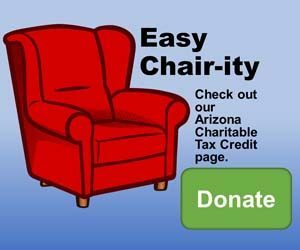 Most clients were previously challenged by homelessness, domestic violence, chronic life-threatening disease, substance abuse, employment and/or job training, learning disabilities or just bad luck.Press Release – Your Choice- Pay Taxes or help a homeless Veteran Bridging AZ is a Federally recognized 501(c)(3) nonprofit organization. In 2003 Bridging AZ began as a ministry of St Barnabas on the Desert Episcopal Church by Jim & Donna Piscopo. The response was so overwhelming Bridging AZ incorporated as a nonprofit in 2004, in the past 11 years Bridging has distributed over 260,000 items to families in need. Here is a list of social service agencies, churches and schools Bridging has helped. Read some more of our History. Bridging AZ does not give away FREE furniture, what we do is partner with social service agencies who identify and qualify families in need – Then the families get a once in a lifetime opportunity to purchase items they need for a nominal fee.